When my mother first approached me about a family trip, I never anticipated it would be so phenomenal. “We are going to road trip out west Becky,” she said as her eyes sparkled with excitement. She had been right to become giddy with anticipation, nearly every part of the trip ended up being wonderful. My brother had been an eligible candidate for the Make-A-Wish Foundation and had recently made his wish. It wasn’t long before they called and zealously said, “You five are going to Western Canada!” The Make-A-Wish Foundation would pay for our RV, accommodations, flights and the highlight of my trip, Banff Alberta. The trip really started for me the day we approached Banff. By this point we had been swept up in a plane, given our beast of an RV and been trekking along the West. Thankfully my family is of the patient variety; otherwise the close quarters would not be the idle living situation. Driving down the road, translucent vapours billow around and encase us in a wonderland of blurry white. The weather had been unpredictable since we landed. Sometimes the clouds would make it over the mountains, pushing as hard as they could until they would cascade down the jagged slopes leaving a trail of fog. Other times they would give up and release the pent up rain in a vicious rage, drenching us with a mammoth amount of wet beads. For days the fog hovered. We camped and drove through it, a dreariness setting in among us. The only sights that meet our eyes are the dull green carpet of the earth and the low hanging cotton balls of the sky. It was on the day that we were closing in on Banff that the fog lifted. The clouds rose up almost as if Mother Earth had exhaled a giant sigh that sent the fog tumbling back into the open sea above. Ribbons of golden warmth stream from the sun and ignite the world around us. No more muted white, Alberta was finally showing off her colours. The first thing I notice without the clouds draped around us are the glittering towers of solid rock that pierce the sky, their scabrous teeth thrust from the ground below. What a show it must have been to see land gnashed together in the chaotic battle of the earth’s crust. The Rockies loom around us, their incredible bulk overpowering the tiny pane of glass I have to look through. “The best thing about road tripping out here is that no matter what we do or where we go, it will never stop being breathtaking,” my sister says as we pull our narrow metal tube into the Banff National Park in Alberta Canada. “Except for when the fog’s too thick to see anything,” I add in. Our first adventure in the park was to hike down a trail that would lead us to Lake Louise. We leave our RV behind and head into the thicket of trees that stretch out for an eternity in front of us. The forest comes alive as chirps, squeaks and the whistling of wind all churn in a whirlpool of sound. The purity of the air fills my lungs and the deep scent of pine tickles my nose. I’m almost positive your eyes will bulge just as mine did if you ever get a chance to see Lake Louise in person. If the lush perplexity of the trees or boasting mass of the mountains aren’t enough to make this the most beautiful place on earth, then the next sight indisputably does. Lake Louise is a pool of blue diamond’s twinkling in the radiating sunlight. The surface lay without a ripple, its clarity startling. 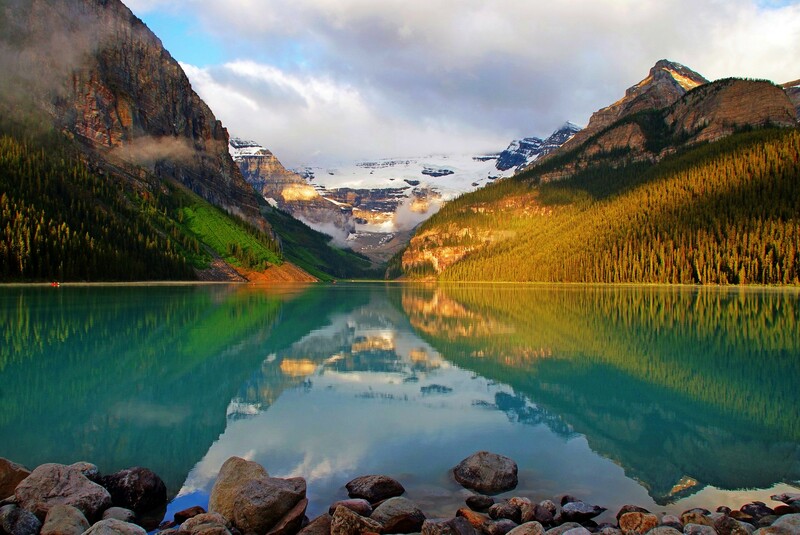 The overwhelming height of cloud-busting mountains is doubled in the reflection of the water. The duplicated image looks blurry and whimsical in the waters soft surface. “Welcome to Lake Louise,” my dad says as he stretches to the sky, taking a big gulp of flawless air. Soaking in the inspiring sights we continue to hike around the massive lake. The amount of wildlife you can see from a hike in the Rockies is startling, especially if it’s bigger then you. We mostly see chipmunks and deer, but occasionally we spot the tiny white specks of mountain goats grazing on the side of the gargantuan rock fortresses. Having snapped an obnoxious amount of photos and feeling our legs beg for mercy, we head back to the Fairmont Chateau Lake Louise where we would be spending the night. As we enjoy our dinner that evening my mother drops a surprise on all of us. She had kept it a secret that we would be visiting the Banff’s Upper Hot Springs. At the news we all proceeded to scarf down our meal and rush back to the hotel room to grab our things and venture to the steaming waters. Something you should know about the Banff’s Upper Hot Springs is that exiting the building is by far the hardest part. With nothing but the scarce fabric of a bathing suit to warm you, rushing into the freezing night air is an exasperating thought. As I look through the window I see people soaking dreamily in the soothing waters, their faces showing nothing but complete and utter bliss. With a nervous squeal I hurry from the warmth of the change rooms and into the nippy night air. I suppose some people like to savour getting into the natural springs, inching their way deeper into the boiling liquid. Not me, I practically throw myself over the side of the tub. The simmering water caresses my skin and the crisp night air blows tendrils of steam every which way. I genuinely believe I could have stayed in those springs forever. The view of the mountains surrounding us, the aches in my body melting away, the minimal light pollution making the stars burst off the backsplash of black. It all created a marvellously surreal environment. Those couple of days in Banff were the most memorable out of my family’s three week road trip around Western Canada. Banff exceeded my wildest hopes and its magic still entangles my daydreams. The unrefined beauty will always be nestled in the part of my mind where only the happiest of memories are stored. It’s a picturesque wonderland every soul should encounter.